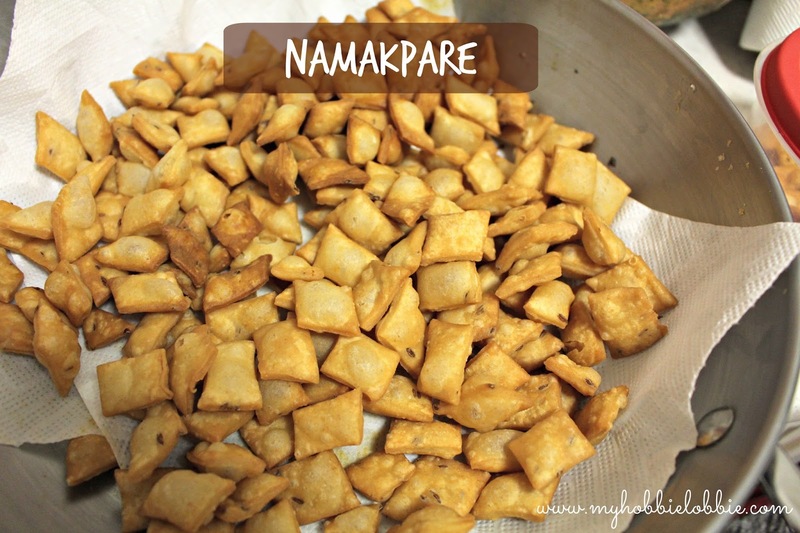 I can't tell you how glad I am to report that I can finally make a good batch of Namakpare. 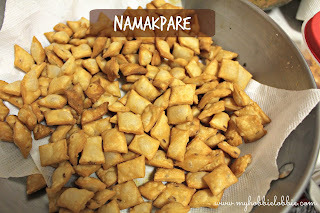 What is Namakpare? These little gems are delicious, savory deep fried crackers. This Indian treat is found on every Indian festival platter (like a cookie platter). 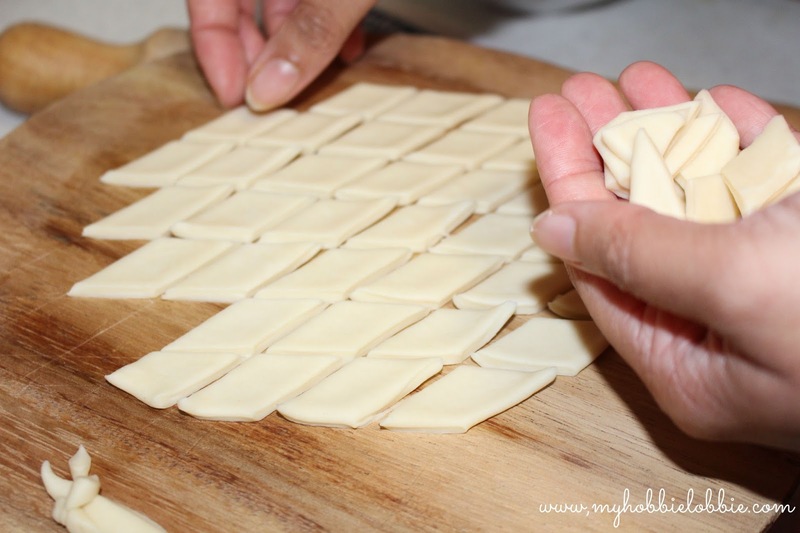 In my household, we never made this at Christmas, but I've always enjoyed them and have always wanted to be able to make some at home. I made some a while ago, and while they tasted right, the texture wasn't. They were not crunchy. You see they are meant to be crunchy and that's what makes them so addictive. I was a little disappointed with this version and that was the end of it. Anyway, I forgot about them for a little while and then all of a sudden, out of the blue, I came across a recipe a couple of days ago when I was looking around online. I decided I had to try them out. I was missing Indian flavours and I figured, this would be a good opportunity to try out another recipe. This recipe simply involves making a tight dough, roll out into a disc, cut into diamonds, deep fry, cool down and ... Enjoy! The ingredients required are also very basic ones. There is a good chance you will have all you need in your pantry. This recipe took me back home in a bite. The crackers taste fantastic, they are crunchy and so very yummy. Once completely cooled, you can store them in an airtight container. Enjoy them with a nice hot cup of tea. Mix both flours, salt and cumin seeds. Add ghee and rub it into the flour. Cover and let the dough rest for an hour. When you are ready to proceed, preheat oil for deep frying. Working with one portion at a time (keep the rest covered so that it doesn't dry out), roll out to a disc about 1/8 inch thick. 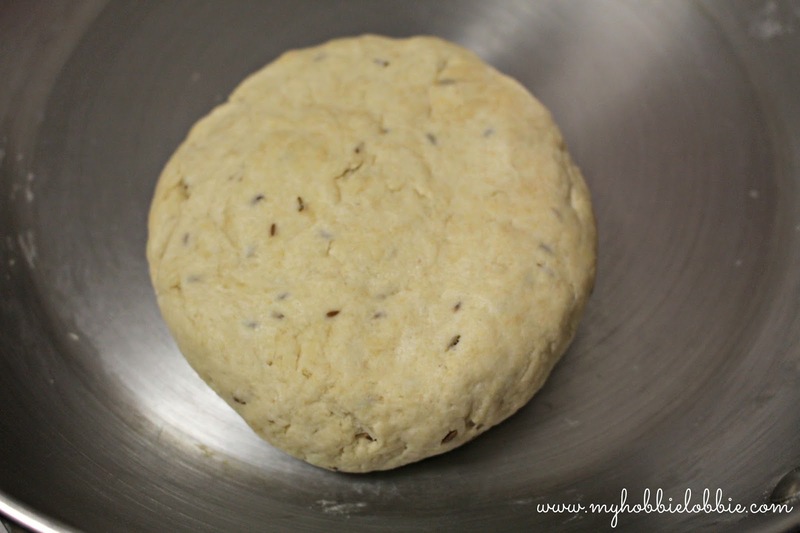 Pictured above is a different dough (the one for methi namakpare .... recipe coming up soon), but the process is exactly the same. You can always re-roll the scraps and cut them out. Carefully place the cut pieces in the hot oil. I usually place the cut pieces in my slotted spoon and place the spoon in the oil and gently tip the pieces in. I find that's the only way I can keep from burning my hands. When they are a nice golden brown, drain and set on some kitchen paper to get rid of any excess oil. Because you've used ghee while kneading the dough, you wont need to sprinkle flour to roll it out, the dough will not be sticky. Fry it over a medium heat. Frying it over high heat will just brown the outside while the inside will still be doughy and won't crisp up.